(David) Allan Slocombe – RE, 292 Army Fld Co, PoW 5266, Taken at Kalamata. Marburg 2 years, then on farm in Austria for 2 years. Man of Confidence, who died on 22 November 2018, aged 99. Allan was a very active member of the Brotherhood, having been a regular, with wife Peggy, at both the UK and Kalamata reunions and he usually carried the standard at both ceremonies. He was a lovely man with a great sense of humour and will be greatly missed. A major programme of works has now been completed to renew and upgrade ‘The Greek Grove’ at The National Memorial Arboretum. This included: gravel being replaced by premium turf; paving stones replaced by limestone slabs: poles cut down to ground level and ground out; the willow dug out and the stumps ground out; and twelve cupressus sempervirens planted around the perimeter. We have been very fortunate in that these improvement works (ground preparation, removal of posts and gravel, laying of turf, tree planting, watering in of turf) have come about through the sheer hard work and dedication of large number of volunteers and Arboretum staff. We now have records for 485 Greek veterans on our website, supplied from our archive. See the section headed ‘Greek Veterans’ for a list of all the names and links to their records. Please email us at greekveterans@gmail.com if you would like to know more about the veterans listed or you would like to provide us with information on these or other veterans (not mentioned here). We will forward all requests and any new information to our Archivist Noah Scott for his attention. 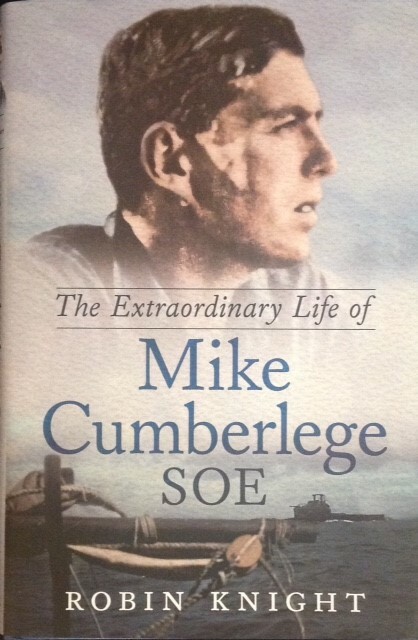 We are pleased to recommend a fascinating new book involving the SOE in Greece: The Extraordinary Life of Mike Cumberlege SOE by Robin Knight. This is the first ever biography about Lt Cdr Mike Cumberlege DSO & Bar, Greek Medal of Honour, who was murdered in Sachsenhausen Concentration Camp some time between February – March 1945. Mike Cumberlege served on the staff of General de Gaulle in London and in a number of undercover roles in Crete and Greece, before being captured during a second attempt to block the Corinth Canal in 1943. Robin Knight has gathered together unique material from Cumberlege’s family and others, to tell the story of Cumberlege’s life. Containing a good selection of photographs, our own archivist Noah Scott is credited with a contribution, along with many others. 163 pages. Hardback published by Fonthill Media LLC. We now have records for 483 Greek veterans on our website, supplied from our archive. See the section headed ‘Greek Veterans’ for a list of all the names and links to their records. Please email us at greekveterans@gmail.com if you would like to know more about the veterans listed or you would like to provide us with information on these or other veterans (not mentioned here). We will forward all requests and any new information to our Archivist Noah Scott for his attention. Sadly, the weather wasn’t great so we held the service in the chapel and afterwards laid the wreaths at the altar in the Greek Grove. Father John, with his wife Georgina, together with Marina from their church, attended. As usual their singing was delightful and really added to the service. We were delighted to welcome Captain P Koulouris, the Greek Defence Attaché; Major Chris Shaw, with his fiancée, New Zealand Defence Staff; and Lieutenant Colonel Anthony Evans and his wife, the Department of Defence, Australian High Commission, who all laid wreaths. Frank Gill, our President, who celebrated his 99th birthday in July, was with us with his daughter Trish and son-in-law Carl. We were also very pleased to welcome, once again, Mrs Dora Cooper, 103 years old. Dora is the widow of L/Cpl Francis Cooper of the 4th Q.O. Hussars, PoW, Stalag 18A. Dora was accompanied by her son Cyril. Four standards were carried – thank you to Paul Hadwin, Thomas Morgan, Colin Pleavin and David Sanderson. In addition to the wreaths laid by our special guests, see above, poppy tributes were also laid by Frank Gill – in memory of Fallen Comrades; Buster (Doug) Beckett – Prisoners of War; Elizabeth Matthews – Widows; Mary Peterkin – Deceased Members and Mark Buttery on behalf of the Brotherhood. Geoff Swinnerton gave the oration. Len Cook, bugler, played the Last Post and Reveille and Barry Parkin acted as Parade Marshall. Many thanks to you all for your contribution. If anyone has information on Major Henry Hill, please get in touch with us via email at greekveterans@gmail.com. His daughter is conducting research into her father’s time in Greece and Turkey. Major Henry Hubert Hill was commissioned on the 1st July 1938. He was with the Royal Fusiliers. He volunteered for SOE and joined them in June 1943. He was parachuted into Greece on the 11th August 1943. He worked ferrying food etc. which was brought in from Turkey in caiques up to the fighters in the mountains. Later he was transferred up into the mountains.